I know, it’s been a while since I last made an entry to any of my blogs as well as my websites. However, just after the 4th of July holiday my trusty laptop computer – basically the web design nerve center of both EdwardRingwald.com and Interstate275Florida.com - began acting sluggish. A couple of days later for no apparent reason, when I turned on my laptop it began to report that there are corrupted Windows system files (the files that enable your computer to work) among other things which prevented my laptop from starting up properly as it should. Once I got my laptop going (finally!) I immediately backed up all the files on my laptop – which contains my work on both EdwardRingwald.com and Interstate275Florida.com including revamping work I was doing on Interstate275Florida.com – onto a portable hard drive. Once that was done, it was off to the Geek Squad located inside Best Buy on North Dale Mabry Highway in Tampa, just north of Interstate 275’s Exit 41. The Geek Squad technicians – called “agents” – took a good look at my laptop and it indeed required service. Luckily, my laptop was covered under a service plan I purchased at the same time I purchased my laptop in December 2006 thanks to a wonderful Best Buy sales associate. Ironically, that was the same sales associate who helped me when I purchased my nephew’s laptop when he graduated from high school several months later! So, out goes the paperwork that the Geek Squad needed to check in my laptop for service. With an in-store turnaround of one week at the time, that meant I would be without my laptop and I would have to be dependent on my two desktop computers I have at home for a while, if not longer. That’s right, no laptop. One week passed. Geek Squad called me and informed me that there were hardware issues that could not be resolved in the store such as the memory modules, among other things. In short, my laptop had to be sent out to Geek Squad Central for repair. That meant another two weeks without my laptop – ouch! Welcome to the world of life without my laptop computer. Things would be a little tougher without my trusty laptop: No checking my email, no working on my websites – I was without my laptop while it was in the hands of the Geek Squad. But I managed to sell a couple of items on eBay using my desktop computer at home. At least that’s what backup computers are for. All of this while my laptop was shipped out of state for repair. Another two weeks have gone by without any word on how my laptop is doing. So, I pay a visit to the Geek Squad over at Best Buy one Saturday afternoon while I am out and about to check on its status. You can check the status of your computer repair at Geek Squad online, but it only gives you little information. However, since I was in the vicinity of Best Buy on Dale Mabry and Interstate 275 I stopped by. The good news was that Geek Squad Central found nothing serious with the hardware part of my laptop, which was a relief. The memory modules were OK and the Windows system files were repaired in order to get the laptop working. Due to file corruption issues within the system files of Windows XP, Geek Squad strongly suggested that I reinstall Windows completely from the restore DVDs. Geek Squad offered to do it for me, but I rather save the money for an upcoming trip by doing the Windows restoration by myself. Unfortunately, the extended service plan does not cover software repair, only hardware repair. So, my laptop was on its way back from Geek Squad Central to Tampa. Wait practically an extra week to allow for UPS to deliver. I got the telephone call when I got home from work that I was expecting: It was the Geek Squad saying that my laptop was ready to be picked up. In other words, after almost a month without my laptop it was time to be reunited once more. It was simple as hopping into my car and making the short drive on Interstate 275 to Exit 41 (the Dale Mabry exit) and to Best Buy. I was excited to get my laptop back, minus some difficulty with a Geek Squad agent who was not interested in rendering good customer service when I picked up my laptop (I spoke to the manager about what happened and it was resolved to my satisfaction). Once I had my trusty laptop back in my hands I took it back home. The next day it was time to reinstall Windows XP using a format and reinstall method to ensure that all the Windows system files are good as intact. But I made sure that I backed up all of my data files – including my website files – before doing so. I spent practically all Saturday afternoon performing a clean reinstall of Windows XP using the recovery DVDs that I had. By late Saturday night after plenty of laptop restarts and uninstalling unneeded software (as well as installing the software I use) my laptop was back in business. Just restore all the data files and I am good to go, which I have done. I got to admit, the Geek Squad did the best job possible in identifying what went wrong with my trusty laptop and even took the time to send it out for evaluation and repair. Now I can work on my websites once again. Without the miseries, of course. Johns Pass - where would you be if you went straight across the Gulf of Mexico? If I were to go directly west right from the bridge tender’s tower of the Johns Pass Bridge straight across the Gulf of Mexico, where would I be? Mexico? Texas? You would land at a town called Port Aransas, which is on the coast of the Gulf of Mexico in Texas. Port Aransas is located east-northeast of Corpus Christi and is the terminus of Interstate 37. The distance from Johns Pass to Port Aransas, point to point straight across? About 900 miles, give or take. Now you think you could build a long distance bridge from Johns Pass in Florida to Port Aransas in Texas? No. There are too many natural and legal obstacles to overcome, not to mention the mightiest engineering hurdle ever accomplished. But I did some Internet searching a while ago for a trans-Atlantic crossing and – to my surprise – I believe it could be done. But let’s say for a moment we had this almighty crossing. What could that do for us Tampa Bay area residents? For one thing, it would open up another source of visitors: The southern west coast of the United States, including California. Add in a few of the western states Interstate 10 covers – Arizona, New Mexico and Texas – and you got yourself another tourist base in addition to the tourist base we get from up north. I know, you got your rants against tourists during Florida’s tourist season as the tourists clog up our roads. But keep this in mind: If it were not for the tourists that come every winter, our state’s economy would collapse. Now with Amendment 1 already passed and budget cuts are everywhere as a result of reduced taxes, we depend on the tourists that come from everywhere more than ever. On a side note, I want to thank the bridge tender out there at the Johns Pass Bridge for leaving the gate open until I was across safely. I recently walked the bridge and I was on my way back to my car. As I was walking across the steel grid deck, I heard the loud sounds of the horn from the bridge tender tower meaning that the bridge tender had to raise the bridge for a boat nearby. As I was headed towards the Madeira Beach side of the bridge, the bridge tender was very grateful to leave the gate open until I got past the gate, then the bridge tender lowered the gate so that the bridge could be raised and the boat could be on its way. By the way, it was on Saturday afternoon, 23 February 2008 at about 4:30 PM. 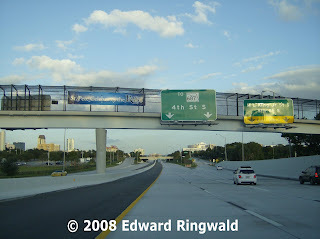 I also have a gallery of Johns Pass Bridge photos and information as a part of my Drawbridges of Pinellas County collection right here at EdwardRingwald.com. To check out the Johns Pass Bridge collection, feel free to click on this link. Besides, while you're there feel free to check out the other drawbridges of Pinellas County as well.